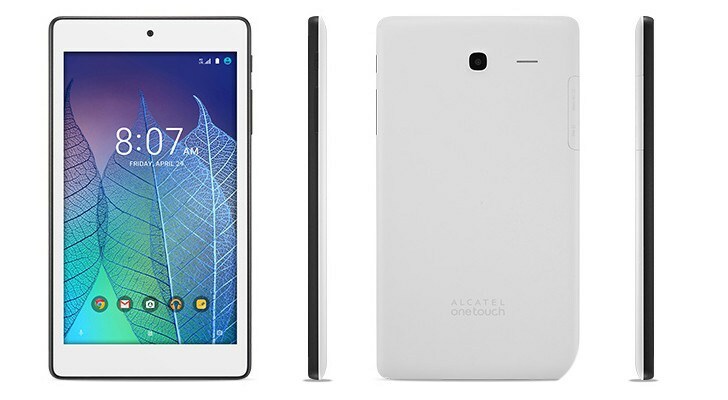 If you are in the market for buying a new tablet that won’t break the bank, Alcatel just announced, for T-Mobile customers, the POP 7 LTE (Try saying that ten times). The POP is a 7-inch tablet with a 1024 x 600 pixel display, driven by a 1.1GHz Snapdragon quad-core processor coupled with 1GB of RAM and 8GB storage, with a microSD card slot for expansion, and also packs a 3,240mAh battery. Alcatel is pushing the tablet with Android Marshmallow available out of the box, entitling it to be one of the few tablets available with the latest version of Google’s operating system. The device seems to be a replacement for the Alcatel OneTouch Pixi 7, and as a 7-inch tablet, it’s a little more portable compared to the 10-inch devices out there. This makes it a perfect companion if you are someone who loves travelling and portability. No doubt that there will be hundreds of cheap tablets released in the near future, most of the components used in these devices may be a few years old, however they are perfectly usable. The tablet industry has seen a decline in the demand for a while, as there are many ‘Phablets’ that give users the best of both worlds, therefore, these companies need to provide new solutions at affordable rates. The POP 7 is fairly inexpensive — at around $129.99, it’s less than most Wi-Fi-only tablets and makes an ideal tablet for occasional use when on the couch or better yet, makes it a perfect companion for your child who has a tendency to break things. The tablet can be picked via T-Mobile for $0 upfront and $5.24 per month for a period of 24 months on a eligible data plan. Are you going to be looking soon at the POP 7 LTE to buy?